Thanks to the latter, I have hung up my running shoes (for a little bit) and taken up mountain biking and other endorphine-enducing exploits. This has gobbled up a fair bit of time (and mental energy) one way or another. But more of that later! Today I felt like venturing into the wonderful world of Attenborough. This is the man with the voice of the smoothest of velvety red wines, whose wisdom is boundless and whose passion and energy never fails to inspire and delight. When I hear Attenborough’s voice, I settle back into my chair and just know that what I am about to hear will be seeped in experience, intelligent insight and a thoroughly comforting sense of awe and wonder at the natural world. It is a wonder that seems to permeate so positively and with such energy throughout all his work – even today. This despite the negativity that seems to shroud anything remotely planetary, that which we all have to digest on a daily basis. One of my son’s Christmas presents this year (from his grandparents) was an audio-CD compilation of Sir Attenborough’s, entitled ‘New Life Stories’. It contains 3 CDs, and the running time is about 3 ½ hours. These recordings (from a BBC Radio 4 series) are written and presented by the wonderful man himself. 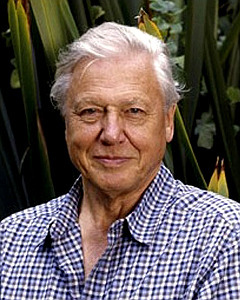 With his unique brand of spittle-emitting-emphatically-enthusiastic dialogue, Attenborough shares many of his various unique and amusing experiences as a nature documentary-maker/presenter of decades. He waxes lyrical about a whole range of unique habitats, bizarre creatures and (often even more bizarre) conservationists and naturalists he has had the fortune (or misfortune!) to meet or learn more about in his long working life. Every episode is as riveting and fascinating as the next. On our last trip north to the Kgalagadi, we listened to the whole CD set on the trip between Cape Town and Niewoudville. We listened to the entire thing again while driving around within the park (sacrilege I do realise, but understand that we had a fairly restless 8 ½ yr old on deck). And then ONCE again on the return journey home – a mere 6 days later. The fact that we (including small person) were riveted every time, speaks volumes about the quality and content. In the next few blogs I will expand on one or two of these incredible journeys or stories. These are ones that really captured my imagination. My next blog will be about one of the world’s first seriously eccentric naturalists….Squire Warterton, of Walton Hall in Yorkshire. He was a complete and utter nutter….but a fascinating one. It’s a story well worth waiting for…I promise.